Earlier this week at the Hot Docs Canadian International Film Festival six distribution experts came together to discuss what’s working in this morphing world of doc distribution: Scilla Anderson, CEO and Co-Founder of IndieFlix; Matt Dentler, head of programming at Cinetic Rights Management; Peter Jager, Managaing Director of AUTLOOK Filmsales GmbH; Aida LiPera, Manger of Acquisitions and Film Festivals for Visit Films; Andrew Mer, VP of Content Partnerships for SnagFilms; and Robin Smith, President of KinoSmith. Film: Fredrik Gertten’s film details lawyer Juan “Accidentes” Dominguez, who on behalf of twelve Nicaraguan banana workers takes on Dole Food in a ground-breaking legal battle for their use of a banned pesticide that was known by the company to cause sterility. Distributor: Jager described AUTLOOK as a “classic sales company” that is full-service in that they do TV sales, whole rights deals, and festivals. AUTLOOK focuses soley on documentaries, and take on about 20 per year. The Deal: Jager said that initially they told the film’s producers that it was not meant for theatrical release. “It had great festival focus, and great TV focus, and we’ll see what about VOD,” Jager recalled saying. But then controversy ignited. Dole threatened the LA Film Festival and sued the filmmaker upon the film’s world premiere at the 2009 edition of the fest. This attention made Jager rethink his strategy, and he started thinking theatrical. Jager also saw major film festivals take interest in the film, such as Berlin and IDFA, which helped spark interest from distributors. Deals are still ongoing, but AUTLOOK has sold the film to Oscilloscope in US, as well as Canada, the UK and numerous other territories. Film: Directed by Chris Smith, the film explores the theories, writings and life story of controversial author Michael Ruppert. Smith interviewed him over the course of fourteen hours in an interrogation like setting in an abandoned warehouse basement meat locker near downtown Los Angeles, which was narrowed into the 82 minute film. Distributor: Film Buff, which Dentler calls “the consumer branding for Cinetic Rights Management,” is a digital/VOD distribution company that releases primarily feature length films. It’s a sister company to Cinetic Rights Media. The film premiered at TIFF to considerable acclaim, and by November, the director had hired David Schultz in the US and worked with KinoSmith’s Robin Smith in Canada to release the film theatrically. Meanwhile, Cinetic Rights Management ended up acquiring the film for digital distribution itself and decided to release day-and-date on VOD to maximize publicity. After the VOD and theatrical window ended, they sold the film to a broadcaster, and managed a DVD output deal through a company they discovered called MPI. But because it was an output deal, they were able to retain the digital rights. So even though the DVD isn’t set for release until June, they made the film exclusively available on iTunes in March to combat illegal downloads. Film: Clark and Jesse Lyda’s doc sheds light on the Hutto Detention Facility in Taylor, TX where asylum seekers, undocumented immigrants and their young children are being detained. Distributor: SnagFilms – an online distribution company for docs (that just happens to additionally own indieWIRE). Launched in July 2008, they now have 1,350 titles from what Mer described as a wide array of partners, from broadcasters to individual filmmakers to distributors. The Deal: The film came to Snag from a liaison at the American Civil Liberties Union, and they immediately were interested in helping the issues it presented get out into the public. “The issue with these detention centers – especially this center in Texas – was that when people dug beneath the surface, these places were basically prisons,” Mer said. “A way to really get that out into the landscape was online,” Mer said. So they arranged to have the film co-world premiere on Snag Films and at the 2009 SXSW Film Festival. The film has been viewed hundreds of thousands of times, and hundreds of organizations circulated it to their members and embedded the film widget on their own sites. Within five months of the film’s release on SnagFilms, the Obama Administration completely revised national family detention policies and closed the Hutto facility. The New York Times front page story on these actions credited The Least of These for having publicized the issue. 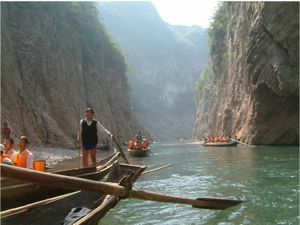 Film: Directed by Chinese-Canadian director Yung Chang, the film focuses on people affected by the building of the Three Gorges Dam across the Yangtze river in Hubei, China. The Deal: Smith had just left his job at another company and was contemplating starting his own when the “Yangtze” filmmakers came to him and showed him the film. Since traditionally in Canada broadcast sales generate 50-60% of the revenue, this posed a problem. But Smith felt the film was so theatrical that he took it on. He sat down with the filmmakers and they formed a partnership wherein Smith did not in essence acquire the rights, but was hired to get the film out into the marketplace. They got some funding from Canadian arts organizations, put in some of their own money, and started the film out in Toronto, then Montreal, and then Vancouver. As a result of the “enormous business” they found in those cites, they decided to spend more money and roll the film out further. In the end, the film grossed over $650,000 in Canada – the third highest grossing doc in the country’s history. Film: Filmmaker Mike Shiley makes a press pass at Kinkos, rents a bulletproof vest and cashes in airline miles to fly to Iraq to make a film about what really goes on there. Distributor: IndieFlix is a multi-platform, independent film distribution company. They deliver DVD and pay-per-view stream from their website, as well bringing their content to third partner platforms. Anderson said they believe filmmakers should keep their rights and that they work very closely with them. The Deal: Shiley decided to take the film out on his own, going to small towns and sharing his story and the film – which often resulted in the film being carried over. This began in 2006, and Shiley would sell DVDs in the lobby. He teamed with IndieFlix to get the DVDs delivered and to get the film available online. The result? After four years of intensely hard work on Shiley and IndieFlix’s ends, the film has cleared $1.2 million. Film: Ole Schell presents a visual diary of his partner Sara Ziff’s rise to international acclaim as a model. The film exposes the modelling industry’s culture of sleaze, exploitation and sexual abuse. The Deal: The film premiered at the GenArt Film Festival in New York last year, and the festival’s director suggested Visit Films check it out. One tactic Visit used to sell the film was getting on board with a design company in London to make a really eye-catching poster that they used to try and sell the film. They then brought the film to selected markets like Toronto, EFM and MIP, being careful not to waste money or time on markets that didn’t suit it. It went on to sell in many major territories like the UK (to Channel 4), which helped bring exposure that got a lot of smaller territories to take interest as well.